The picture postcard village of Fowlis Wester can be found some four miles east of Crieff, just over half a mile along a minor single track road that heads north from its junction with the A85. As you arrive, you enter an open area, grassed over on one side, and tarmaced on the other. In the middle of what was presumably the village green stands a small square enclosure, defined by iron railings, and within the enclosure is the simply magnificent Fowlis Wester Sculptured Stone. The Fowlis Wester stone is 3.14m high by 84cm wide, by 15cm deep and is often said to be the tallest Pictish symbol stone known to have survived: presumably using a definition for "symbol stone" that somehow excludes the 6.5m tall Sueno's Stone standing on the outskirts of Forres. But setting this aside, there is no doubt that the Fowlis Wester stone, sometimes called the "great cross slab" is utterly magnificent. 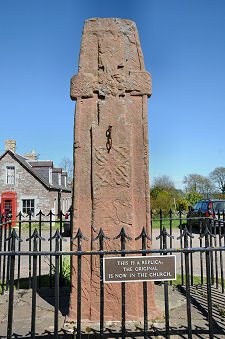 It is also unique among Pictish cross slabs in that the arms of the cross depicted on the front, western, face of the cross extend beyond the sides of the rest of the stone. All four arms of the cross are rectangular, and in its centre are nine bosses. The further down this side of the cross you go, the more weathered it becomes, but it is clear that the cross was ornately carved across its whole surface. The rear, or eastern, side of the Fowlis Wester stone is topped off by typical Pictish symbols. More striking, however, are the hunting scenes which have been carved onto much of the rest of the rear of the stone. Topping off this part of the carving is a horseman with a hawk on his arm. Beneath him is a large hunting dog; then two more horsemen; then men with shields and a cow. There are more Pictish symbols at the foot of the rear of the stone, including an eagle. 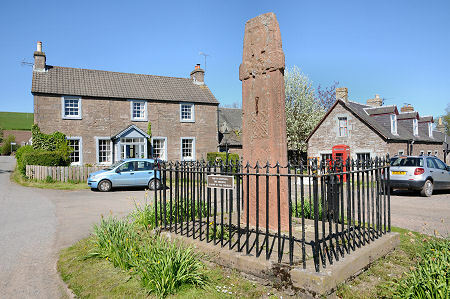 The stone that stands on the village green in Fowlis Wester is actually a replica. The original stone was moved into Fowlis Wester Parish Kirk in 1991 to protect it from the elements. We're always in two minds about some of the efforts that have been made to protect the irreplacable pieces of history represented by Pictish symbol stones. Moving them into the shelter of a church or a museum and leaving an empty socket preserves the stones for posterity, but leaves the original location much the poorer. On the other hand, trying to protect stones in situ by surrounding them with some form of shelter can, depending on the location, make them impossible to see in the overwhelming reflection of sky bouncing off the enclosing glass. For us, moving the original to a safe location, where it can still be seen, and replacing it with a replica that most of us would be hard pressed to tell was a replica is just about the perfect solution. 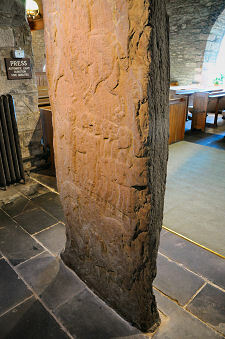 The Fowlis Wester stone was, it is believed, carved at some time around 800. It was originally located next to an ancient chapel, long since demolished, at Buchanty, some three miles to the north of Fowlis Wester. At some point, presumably, in the very early 1800s it was moved to the village green in Fowlis Wester and the railings were added. The stone was again moved, this time into into the kirk, and replaced with the replica you can see today, in 1991, at which time it was confirmed that its setting in the village green was relatively recent. Fowlis Wester Parish Kirk is only a very short walk away from the village green. The kirk is medieval in origin, and it has looked much as it does today since 1927, when changes of the 1700s and 1800s were reversed in order to "re-medievalise" it. The result is a beautiful church with a great deal of character. The day we visited a wedding was taking place, and it is easy to see why this is a church where people choose to celebrate very special events. We should hasten to add that the interior photographs were taken after the ceremony had finished and the wedding party had moved on to their reception. The kirk comprises a long rectangular space, with a broad arch on the north side leading through to a very short north aisle. The original Fowlis Wester stone is displayed within the aisle. A well signed switch on the nearby wall causes the stone to be illuminated for five minutes at a time. Or perhaps that should be "stones". 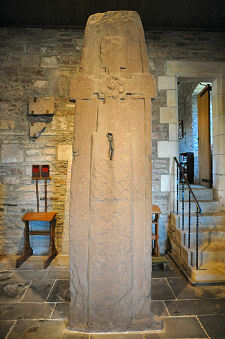 Set against the north wall of the aisle is a second Pictish cross slab. This was found built into the structure of the church in 1927, and recovered for display. 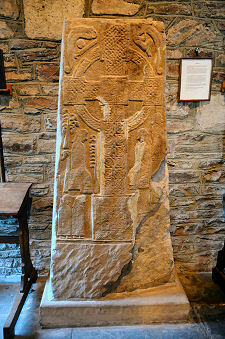 The second carved stone is rather smaller than the great cross slab, but the carving is very much crisper. This is doubtless due to its having been buried within the structure of a wall since the 1300s. Indeed, it is actually possible that the stone was never exposed to the elements at all. The bottom right hand corner of the front face of the stone has broken away. It is clear that this happened after the mason had carved the detail on the front of the stone, but before he did the sides and back. There are signs that the mason tried to cover up the problem by carving into the broken area, but he then seems to have given up. The stone may well have been discarded at that point, five hundred years later to make its way into the wall of a church, and six hundred years after that being found and finally exposed to view. 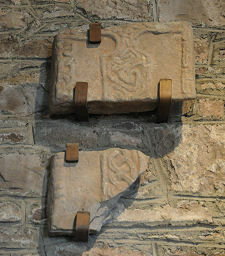 Fragments of a third Pictish stone are also on display, and there are said to be others known to be still within the structure of the kirk.